That sounds like the title of a fairy story! But unlike a fairy story, this was happy from beginning to end. 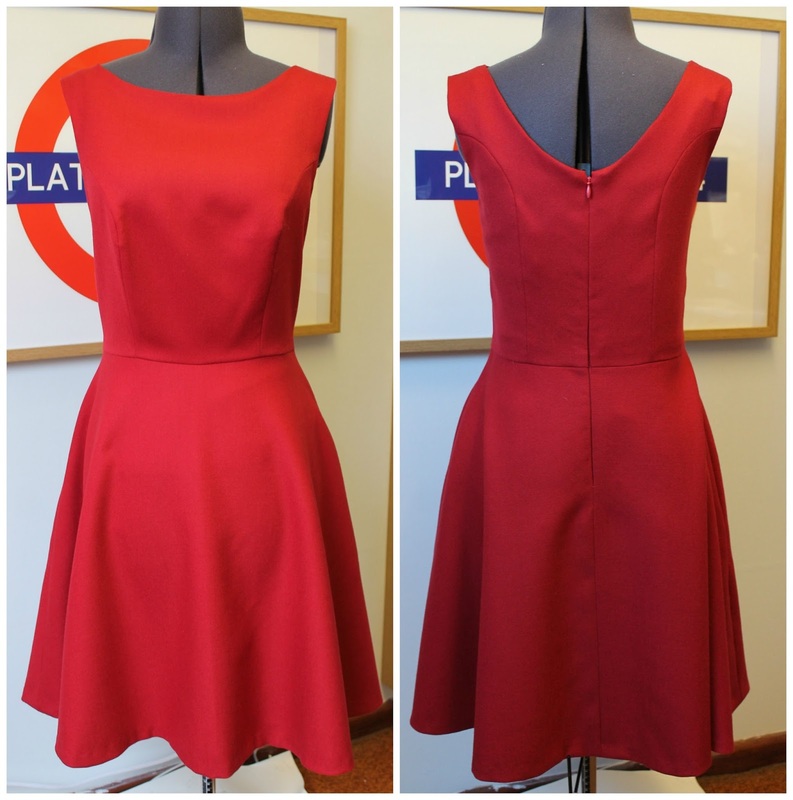 One day, before Christmas, I was on my tea break in work, and suddenly felt the need for a red wool dress. So I did what any sensible sewist would do, and opened up ebay on my phone! About 10 minutes later I had found this end of bolt of red suiting - there was 1.7 metres, and it was £9.99 with free postage. And obviously it would have been rude not to click on buy; so that's what I did! 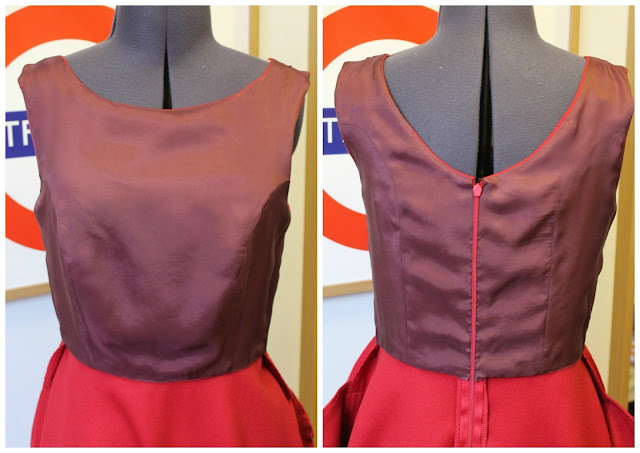 The inspiration for the dress itself came from Amy at Almond Rock's red Butterick 5748, and Lara from Dreaming Of Avonlea's red velvet dress. I was tempted to try to re-create the V at the front of Amy's dress, but was a bit scared of trying to sew the bottom of it! But I shamelessly copied the scoop back from Lara's dress. Sadly, I stupidly forgot to stablise the scoop back other than to stay stitch it, and it gapes a bit. I really should have eased some twill tape or seam binding in; but, hey, I can't see it when I'm wearing it! The bodice is lined with some unknown something from my stash. I'm guessing it's acetate or polyester, but I have absolutely no recollection of buying it. The photos of me wearing it are closest to the real colour. It looks quite orange in the photos on the dress form, but is really a rich red in real life. The bodice is self-drafted, but is not unsimilar to the By Hand London Elisalex dress; the skirt is my good old half-circle skirt. And that's really all there is to say about it, so I though I'd show you what I sewed it on - it's my little featherweight. I think I might have mentioned this before, but I definately talked about my big featherweight here. My big featherweight came from my Dad's Mum, and my little featherweight came from my Mum's Mum. Both of my Grannies sewed, and actually both worked as stitchers in the shirt factories in Belfast. The little featherweight is a 221k4 from 1952. I got it nearly two years' ago when it was found in my great Aunty's house (my Granny's sister); and I got it serviced, so it works beautifully. It only does a straight stitch and you can change the stitch length, and that's it! I honestly have so much respect for my Grannies sewing on these machines! I loved using this, and will definately be using it more. Even though it's really small, it's quite heavy (who named them featherweights?! ), and it felt like it was bolted to the table - it seriously didn't move 1 millemetre. Also, it makes the loveliest sound when it's sewing! I have to thank Shirley from Squirrel's Knitting Conquests for inspiring me to use it. It doesn't even have any measurements on the footplate for the seam allowances, so I improvised with some masking tape and a marker pen. Below is the stitch length selector, and I had to google how this works. The numbers are stitches per inch, so the larger the number, the smaller the stitches. I'll leave you with some photos enjoy. Has anybody else been using an old machine lately? Your dress is so beautiful Lynne, a gorgeous colour. But then, red is my most favourite colour in the whole wide world. I love my little Singer machine and I totally agree about the weight and even the attitude the machine boasts. There is no nonsense when they make each stitch, the movement feels sturdy and determined; it says no fabric is going to move on my shift. Lol! Thanks Shirley! And thanks again for the inspiration to use my little featherweight. Totally agree with you on red, it's my favourite colour too, and I have a red raincoat planned, and two red summer dresses. Thank you! I'm so glad I'm not the only one who wonders where on earth that piece of fabric came from!! Thank you! I really do love red! I also love my old machines, but won't be giving up my new machines either. Got to love the automatic buttonhole features on new machines!! Thank you Ruth! Couldn't we be spending our money on worse things than fabric?! A beautiful dress. It looks like a perfect fit. I love how the red emphasizes your pale skin; very attractive. Great bodice. Well done. I am currently working on a somewhat similar look in a black, linen/cotton dress with a bodice with a jewel neckline, sleeveless, with French darts, and an a- line skirt. Your dress inspires me. I hope to really get it right, like you obviously have. Thank you! Being pale doesn't lend itself to plan colours on me. Sadly turquoise blue and I shall never be friends... Good luck with your dress, it sounds gorgeous. Thank you! I hadn't thought of it being festive, but it's nice and warm for the winter. The red dress is beautiful - I know the feeling of having a sudden absolute need for a particular fabric or pattern! The Featherweight is amazing - I love how vintage machines just seem to go on forever! Thank you! Aren't these old machines indestructable?! I can't see my new machines still being around in 60+ years. I wish I hadn't got rid of all the old sewing machines that I had inherited before I was interested in sewing. Hopefully they all have good homes now and are well-loved. Your dress is great, it's a wonderful colour. Thank you Helen! I've no doubt your machines must have gone to good homes, and it's a great excuse to treat yourself to a new old machine!! I'm so behind with my blog reading. Live this dress! So simple but a knock out! !